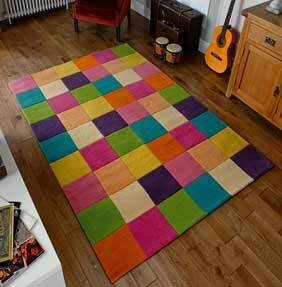 Three modern designs, handmade from pure wool in India, each design is made from multi coloured wool. Gio, a check / block pattern made in multi colours, idea for modern decors or children's bedrooms / playrooms. Sumi, chunky loop pile with loads of texture and colour, ideal for modern rooms and trendy apartments. Vesta, similar to Gio but features a multi colour stripe design, ultra swanky and fashionable. Each design is available in 3 stocked sizes, bespoke made to measure sizes are available to order.